Henri Matisse, 1869-1954, one of France’s famous artists in art history painted "The Joy of Life" in 1905-06. Associated with a group of artists whose work first appeared in 1905, his work, along with others, was labeled Fauves (wild beasts) in the same derogatory manner as the first Impressionists had been labeled. 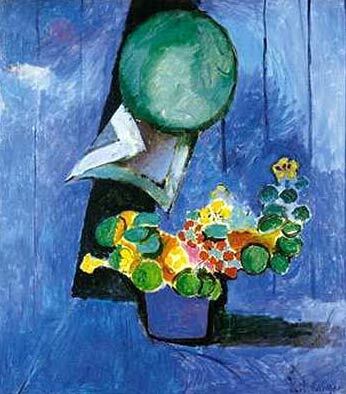 Matisse's style began to mature around the time of the 1905 fauvist showing. Until this time he experimented with picture structure, copying works of art in the Louvre. Examples of this experimentation are "La Desserte",1897 an impressionist style, and in 1901, "La Coiffure", with influences from Cezanne and Gogan. Henri Matisse departed from these works painting "Olive Trees, Collioure", in 1905. He learned color could be an entity unto itself and not used solely to describe objects in space. Art could be about color and color relationships owing no allegiance to the true color of an object in nature. In 1905, Matisse painted painted one of his most famous paintings, the portrait of "Madame Matisse", in this manner. The portrait is not an exact detail replication of the sitter, but a portrait about pure color and color relationships. Liberty was taken when Matisse painted green line down the middle of the face almost dividing it in half. The green line acts as a keystone for color relationships in the painting. The entire mood of the painting is effected depending on the color this line is painted, therefore "Madam Matisse" is a study in color relationships as well as an art portrait. Henri Matisse’s"The Joy of Life", 1905-06, is a painting that expresses the art of Fauvism best, with it's large areas of flat bold color, the selection of heavily outlined forms balancing the composition creating linear rhythm, and it's rather primitive shapes and color owing little to nature. Fauvism was not a formulaic or systematic method of painting. After about two years, the Fauvists as an art group split in different directions based mainly on the addition of their own stylistic experiments to the original base ideas of Fauvism. Reducing his compositions and color to a minimum, Matisse later painted another famous painting "The Dance" in 1907. The picture is a flat plane as are the figural representations with no three dimensional detailing. Matisse was interested spontaneity, in color, in lyrical lines, and minimalizing compositional characteristics to their simplest form. In 1916, Henri Matisse painted the "Variation on a Still Life by de Heem" and in that same year painted "The Piano Lesson" influenced by the the Cubist art style. Large geometric areas of pure color set the compositional mood, line form and color are again reduced to their basic elements. In 1917, Henri Matisse again made a stylistic change in art history. His picture plane became more decorative with heavier applications of paint, influenced compositionally by Oriental art. "The Moorish Screen", 1921 is an example of this change. It differs from "The Piano Lesson" in that the large divisional areas of color are now filled with loosely painted decorative elements. A series of photographs taken of Henri Matisse’s “Lady in Blue”, 1937, show the develoment of a painting and how the artist responds to nature emotionally, then relaying that emotional message in form and color on canvas. The photographs and the final painting is an example of the mental mechanics an painter goes through day to day reducing a composition to it's basic elements of line, form, and color. To view gallery 1, Henri Matisse posters, click here.